Views based on the current state of affairs in Malaysia, Regionally & Globally. What lies in the future for Malaysians especially the younger MCOBs – Career and Professions, Businesses and Corporates, Quality of Life. What MCOBs can do that will make a difference? MCOBA Luncheon Series are series of get together among Malay College Old Boys (MCOBs) across batches and backgrounds to get insights on various issues from a casual discourse with MCOBs leading industries in the country. This agenda will create values and stronger bonds among MCOBs by getting the first hand information from the decision makers and captain of industries based on their vast knowledge and experiences. The luncheon series will be organised by JPM frequently every month or two and be hosted by the particular speaker that will be identified and suggested by fellow MCOBs. 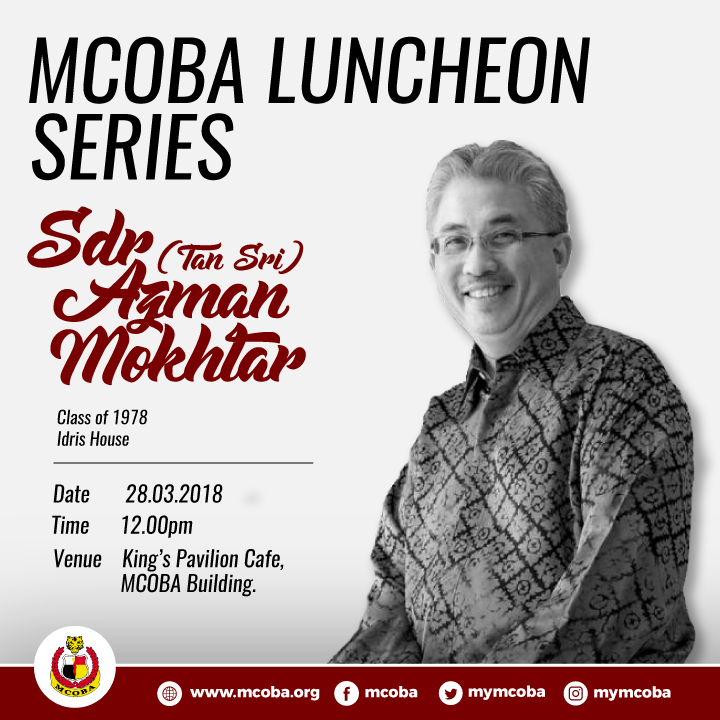 MCOBA Luncheon Series with Tan Sri Datuk Wira Azman Mokhtar or we casually call Amok from Idris House and Class of 1978, is one of the many Talk Series been organised to engage MCOBs directly with these icons and figures of the Country. The Luncheon Talk will take place at Kings Pavilion Cafe, MCOBA Building from 12.00PM onwards, Wednesday 28th March 2018. Put on your stripes and lets join us and RSVP via http://goo.gl/QY382E. Tan Sri Datuk Wira Azman Mokhtar is the Managing Director of Khazanah Nasional Berhad. He is also the Chairman of Iskandar Investment Berhad and Axiata Group Berhad, as well as Trustees of Yayasan Hasanah and Yayasan Khazanah. He holds Board memberships at the Khazanah Research Institute and Asia School of Business. He serves on various Malaysian public service bodies including the National Science Council, the National Innovation Agency and the National Export Council. He is a member of the Asia Business Council. He was formerly the Managing Director and co-founder of BinaFikir Sdn Bhd; Director/ Head of Country Research at Salomon Smith Barney Malaysia; and Director/ Head of Research at Union Bank of Switzerland in Malaysia. He also served in various capacities at Tenaga Nasional Berhad, Malaysia’s largest electricity utility company. He obtained his M.Phil in Development Studies with distinction from Darwin College, University of Cambridge and a postgraduate diploma in Islamic Studies from the International Islamic University Malaysia. He is a Fellow Chartered Certified Accountant and a Chartered Financial Analyst.